TYA series oil filter special oil based hydraulic oil, mechanical oil, lubricating oil impurity mass of the development and production of special features, the machine processing cycle is short, high efficiency, rapid removal of oil in the water, gas, impurities and volatiles (such as alcohol, gasoline, ammonia, etc.). Improve the oil quality, recover oil viscosity, flash point and performance. Ensure that the hydraulic system, power system, the lubrication system normal operation. Particularly suitable for petroleum, chemical, mining, metallurgy, electric power, transportation, machinery, railway and other industries on the hydraulic oil, mechanical oil, cooling oil, refrigeration oil, gear oil, gasoline engine oil, diesel oil, heat treatment of various lubricating oil purification regeneration process. 1.Strong ability to filter out impurities, large, deep-level precision filter to remove fine particles in the oil. 2.Automatic backwash feature: automatic cleaning filter retention of large amounts of impurities. 3.Advanced Media endothermic condensation system. 4.Pressure protection, automatic temperature control heating, automatic condensate separation device is simple, safe, and reliable. 5.High-quality filter, pollutant carrying capacity, corrosion resistance, high temperature, mechanical strength, in addition to impurities, high precision, long service life. 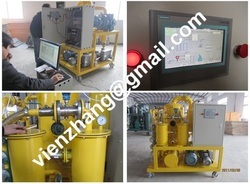 6.Unique degassing, dewatering systems: the use of three-dimensional evaporation technology, multi-level oil-water separation technology, the rapid separation of oil in the water, gas and impurities. 7.Electrical system used in all imported electrical appliances, to ensure that equipment with high performance. This oil purification can fast Degas, dewater, and remove the impurity and the volatile matter (for example ethyl alcohol, gasoline, ammonia and so on). Enhances the oil quality, restores the lubricating oil viscosity, augments the flash point and improves the operational performance. Guaranteed the hydraulic system and the dynamic system, the lubrication system normal operation, so the machine is set for many lines, such as the mine, metallurgy, electric power, transportation, manufacture and so on. In order to achieve optimal dielectric strength and insulating performance inside of transformers and circuit breakers, dielectric oils must be kept absolutely clean and dry. ZHONGNENG designs and builds the most effective, durable, and easily operation high vacuum transformer oil purification system on the market today. Transformer oil treatment plant means?Old transformer oil is generally mixed with gas, water and contaminants, and also the new transformer oil sometimes, the content of the contaminants generally increases fast by time. So the transformer oil treatment machines can remove these associated gases, water and contaminants, and separate them from the oil and take them away. After treating the oil by our oil treatment plant, the stabilized oil is then again ready to be used in power transformers. III. It can vacuum filling oil to transformer, vacuum dry transformer and on-line operation transformer . IV. It is mainly used for purifying the insulating oil, transformer oil, mutual oil, switch oil, dielectric oil and so on. The standard ZYD system is designed for processing oils in workshops, in storage tanks or directly in transformers (energized or de-energized transformers). 6. Working with BZ insulating oil regeneration device to decolor (remove acid, oxide, free carbon) and lower dielectric loss, making the treated oil more limpidity.mining enterprises purifying the unqualified transformer oil, mutual inductor oil, switch oil and so on. 1: It is for treating various insulating oil, including transformer oil, mutual inductor oil, switch oil. 2: It is widely applied in large scale manufacturing factory, power station and other related industrial fields which will use transformers, especially for over 110 KV transformers. 3: Double stage vacuum system, adopt international advanced duplex stereo-evaparation technology and UK G technology to eliminate the trace water in insulation oil and recover its breakdown voltage greatly. 4: Adopt Germany's 3 UG phase replay, can make the machine working efficaciously and safely at any situations, such as power off, lack of phase, wrong phase position, etc. 5: Equipped with advanced dielectric condensation devices for greatly prolong the oil purifier service life. 6: A trinity of interlocked preventive device is applied for avoid the machine being damanged from any accident automatically. 7: It also can be used as a separate vacuum system for dehydrating oil only, don't need to run all process and can save time and consumption for different request on oil filtration. 8: It can work onsite with the transformer running together. 9: A PLC system can be attached as per customer's requirement. 10: It can be moved easily with equipped steel wheels, it also can be designed for different structure of fully enclosed type and fully enclosed trailer type for the purpose of ourdoor use and indoor use. 11. Various color of this model can be produced just as customer's favor. We know that oil ages in a Transformer and reduces the life of Transformer. Oil ultimately begins break-down due to foreign particles / impurities such as water, gases, sludge particles, colloidal carbon and mainly acidity etc. When the oil in a Transformer reaches this stage, where purification/degassing is no longer efficient, the oil must be changed or reclaimed. Reclamation is the complete treatment of oil to a like-new condition. This process of reclamation is applicable to any size and type of transformer in industries. Above process of oil reclamation is a 100% solution for achieving the required properties of oil, whereas by simple process of filtration, it is not possible to get these properties. In order to achieve optimal dielectric strength and insulating performance inside of transformers and circuit breakers, dielectric oils must be kept absolutely clean and dry. ZHONGNENG designs and builds the most effective, durable, and easily operation high vacuum transformer oil purification system on the market today. The series ZYD Double-stage vacuum Transformer oil regeneration purifier not only provide dewaters, degases and remove impurities, but also remove acidity, sludge, free carbon, other soluble oil decay products and discoloration. 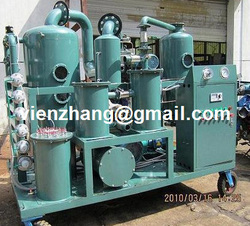 Also it can vacuum filling oil to transformer, vacuum dry transformer and on-line operation transformer. The Zhongneng Oil regeneration system (Series ZYD-I) has been specially designed for on site use to completely regenerate insulating oils in energized or de-energized transformers especially for the power, which is over 110KV. Also it can inject the insulating oil into the transformers on-line. The ZYD-I system provides regular oil purification such as degassing, drying and particulate removal but also can remove acidity, sludge, other soluble oil decay products and discoloration. This is accomplished by the use of high vacuum degasification technology and particulate filters combined with our special brand of earth. After treating, the oil can be reused as new. For special application, the system also can be mounted on a leak proof base and can be installed and operated on a trailer. 2. Operational can be P. L. C (Programmable Logic Controller). It is used for treating the unqualified turbine oil, especially the seriously emulsified turbine oil. This products, which can rapidly and effectively remove the water, gas and impurities, break emulsification. It aims at turbine oil’s nature of high water content, easy emulsifiable and high impurity content, and makes the oil recover the new oil's nature. Series TYA is special for purifying all kinds of lubricating oils, such as the hydraulic oil, mechanical oil, coolant oil, gear oil,heat treatment oil and so on. According to the lubricating oil's nature, this machine can rapidly remove water, gas, particulate matters and impurities from lubrication oil, so guarantee lubricating system of machine to work properly and prolong lifetime of machine. 4. Zhongneng's unique technology with H.P.M high molecule absorption material. 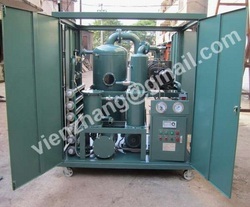 Mobile closed transformer oil purifier oil purification oil recycling oil regeneration oil treatment oil filtration is special for treating the used and old transformer oil, mutual oil, switch oil. 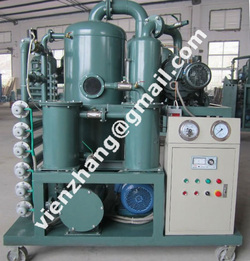 Comparing with the single stage type, this machine adopts the double stages vacuum system, which can improve the machine working vacuum value highly, so it can remove the water, gas and impurities in transformer oil high-efficiently, increasing the pressure force and quality of oil, make sure the electric device running safely. 1 According to fieldwork requirement, this machine equips car wheels, which can be easily moved to any work point by traction. It can be moved kms per hour , which suit to work in wild place. Its has weatherproof function which can protect the machine from bad weather. 2 The machine is specially applied to vacuum filling oil and drying for power transmission equipments that are over 110KV. 3 It is especially suitable for purifying transformer oil which locates in fields. 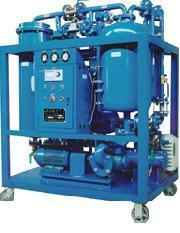 This machine can seriously recover transformer oil. The treated transformer oil can reuse again in transformer. 10. The Automatic oil purifier model is installed with PLC (Programmable logical control system) which can control the equipment automatically to every stage of its process and ensure its process and ensure its safe operation on site and on line without human supervision. be an independent vacuum power supply, this machine can treat the electric insulation devices.